After being drawn in to the story of a prankster Hokage wanna-be turned bona-fide ninja with the help of his (ahem) inner strength, there came a time there-after that the show just made me stop caring. Actually, it was after attempting to watch Episode 161 to be precise. After that, I just stopped watching it all together. I had my fill of the filler arc. When Naruto Shippuden came out in February of this year, I was hopeful but not completely certain that they could revived it from the dregs of lost causes. The first episode was promising with the opening sequence, however, the story soon dragged itself into a much slower pacing (which some might argue has been a problem with this series all along). 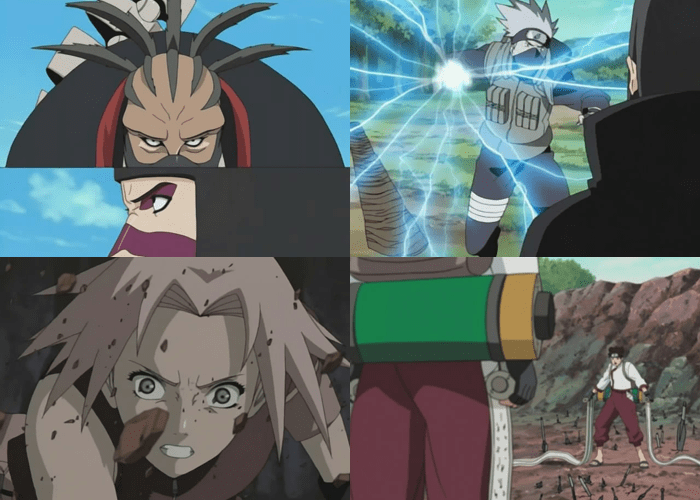 It is only after they veered away from the rather boring Bell Test in episode 3, that things started to pick up with a fight between Gaara and Deidara. As good as it had been getting, none of these previous episodes had moved me in the way I was moved when I first fell in love with the series. This all changed in the 1 hour special that starts in episodes 29. Finally, we get to not only see Kakashi’s new sharingan eye in action, but a also a resurgence of the Naruto’s fox cloak. Is this the new Naruto show or something, because I’m from Pennsylviana and we still have the regular Naruto. Anyway csn you tell em more about Naruto crying and why Gaara is on the floor looking dead. Nicely said. Also yea October is a long time to wait… or the middle of October however. Clearly, Gaara is just to good for even, Naruto, Kakashi, And Rock Lee. Though. He’s changed, But it wont take that long for him to turn bad again. I wonder if he still use’s the same gimike, He’s been using “Don’t get in my way!” I lovei t when he says it. I ever wonder, If Gaara will actually be loved now, I felt awful when he was Ingored and pushed out of his own village.